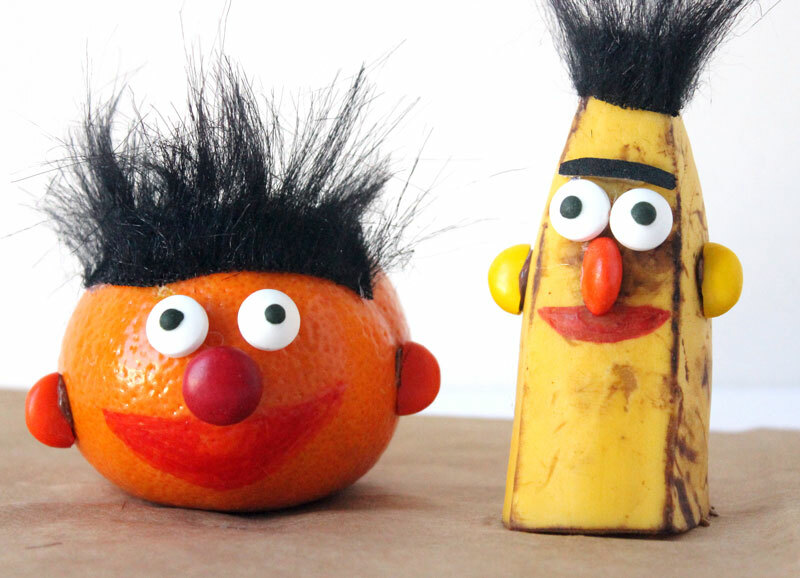 Bert and Ernie Snacks - that are super healthy too! 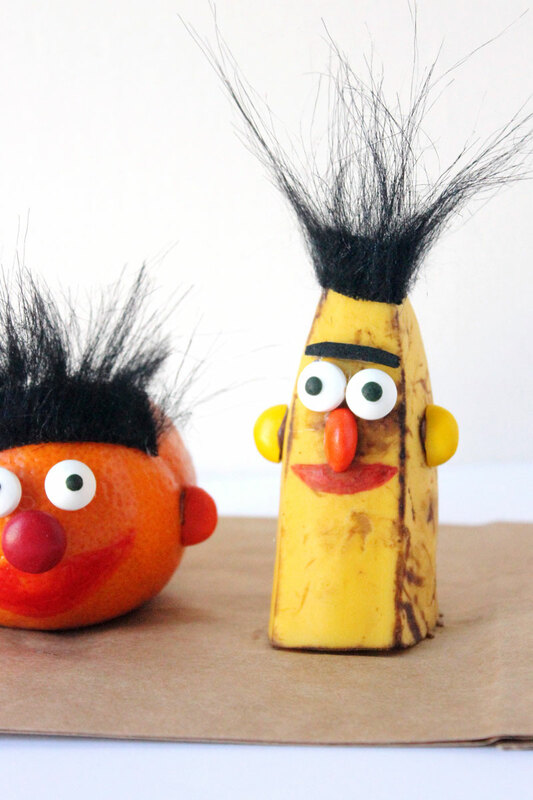 I’m thrilled to present to you these adorable Bert and Ernie snacks by Alyssa from Arts & Crackers! It’s quite different from your typical food craft because it’s, well, more crafty… and I love that! One PSA about the eyes: if you keep Kosher, these are very hard to find with certification. However, since it’s not being eaten you can use googly eyes. Or make your own as instructed below. And now, I’ll hand this over to Alyssa…. 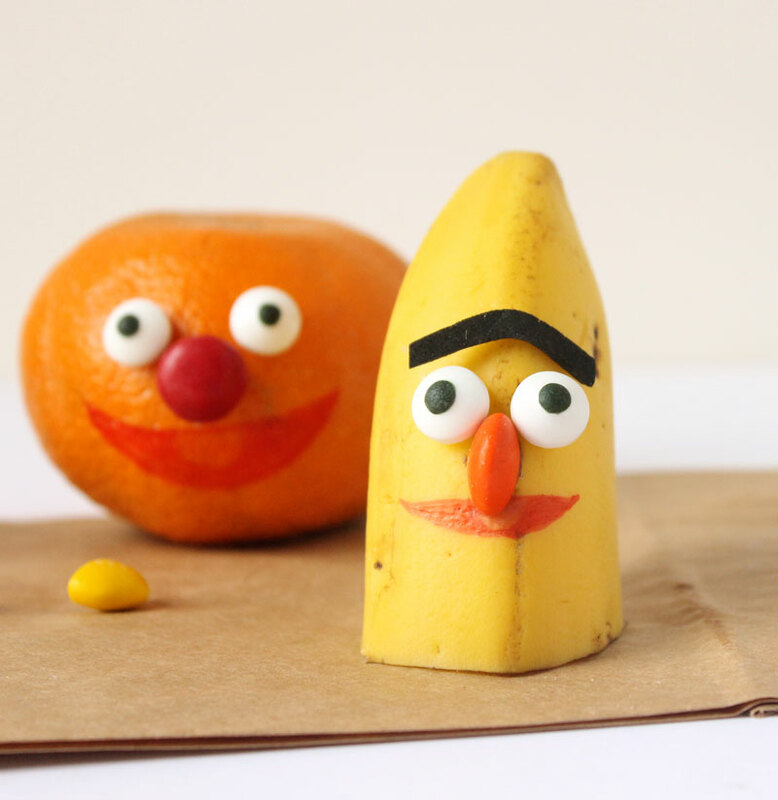 Add a smile to lunch or snack time with these Bert and Ernie snacks! Growing up, I watched a lot of Sesame Street. Bert and Ernie were such great friends, it reminded me of my boys. 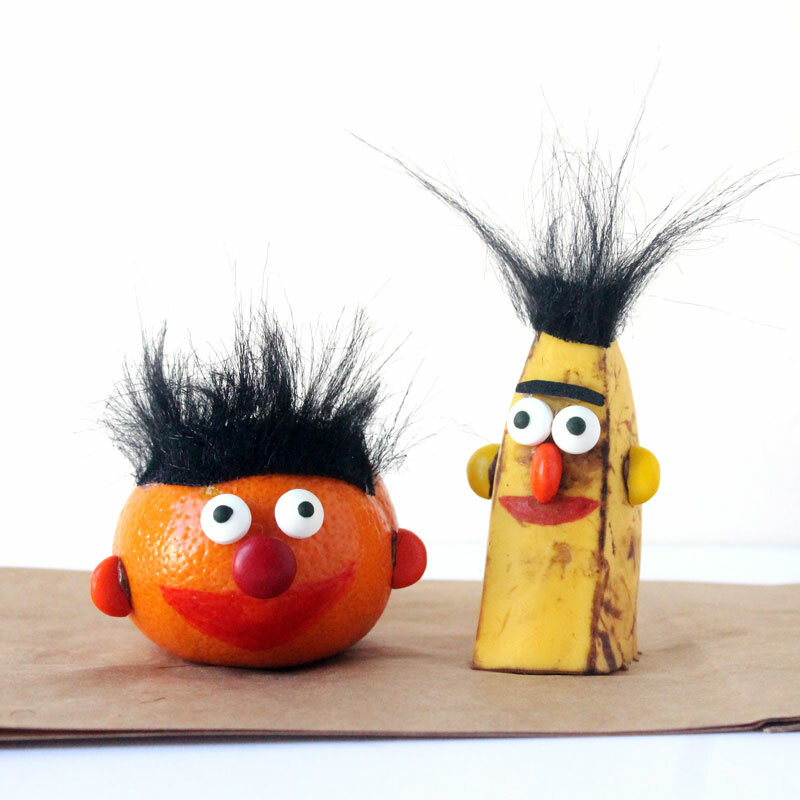 As I went to hand my boys their usual banana and orange for lunch, I noticed how they looked quite like Bert and Ernie. 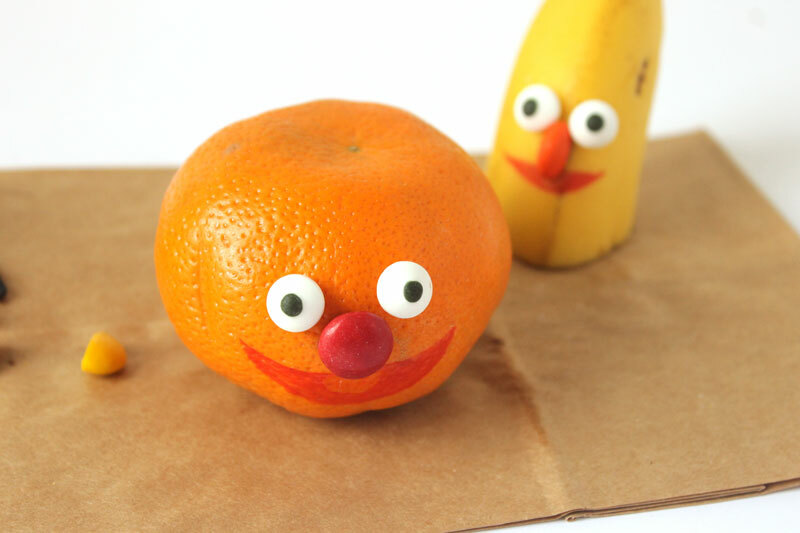 We are always looking for ways to make lunches and snacks a little more fun, and Banana Bert and Orange Ernie were a huge hit. 1. Cut the banana in just under half. You can use the top or bottom, but if you use the top you will want to trim the stem. 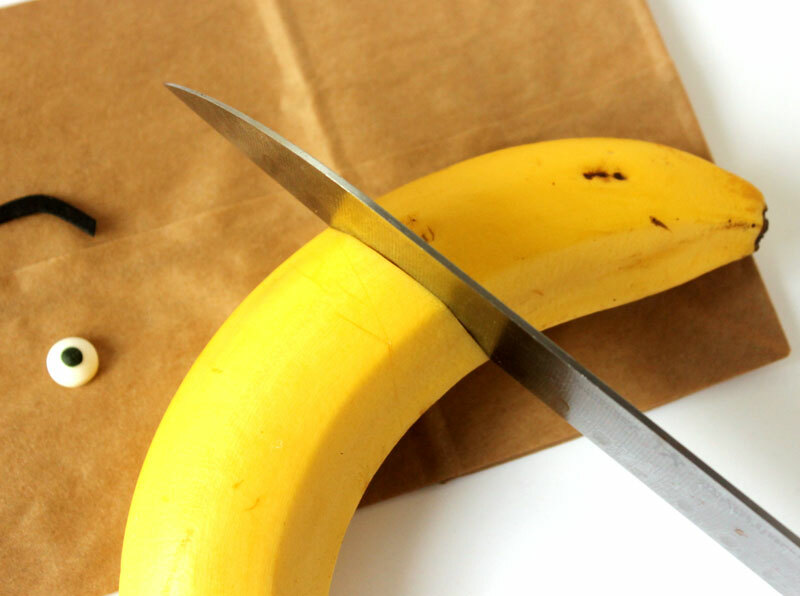 If needed, cut off a small amount on an angle so the banana stands up properly. 2. 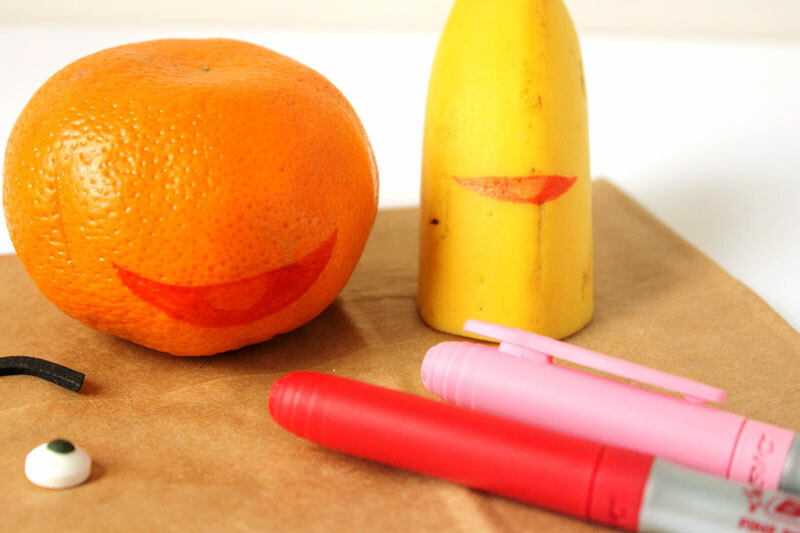 Figure out where you will want the mouth on the orange and the banana and draw them on using permanent markers–pink for the tongue and red for the rest. 3. 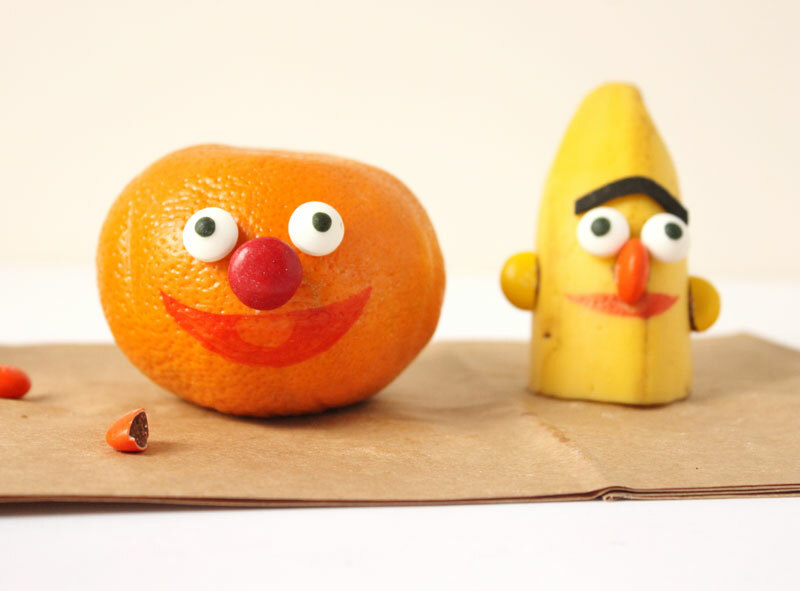 Glue on the noses*–1 red M&M for Ernie (the orange) and half of a yellow M&M for Bert (the banana). You can use hot glue for this (low heat is best, as the chocolate for the half M&M will melt–otherwise just use a dab and barely press down) or you can use the edible glue. Alternatively, you can hot glue on noses cut out of colored craft foam. 4. Glue on the eyes using hot glue or edible glue. * Their eyes should be touching their noses (see pictures for placement.). 5. 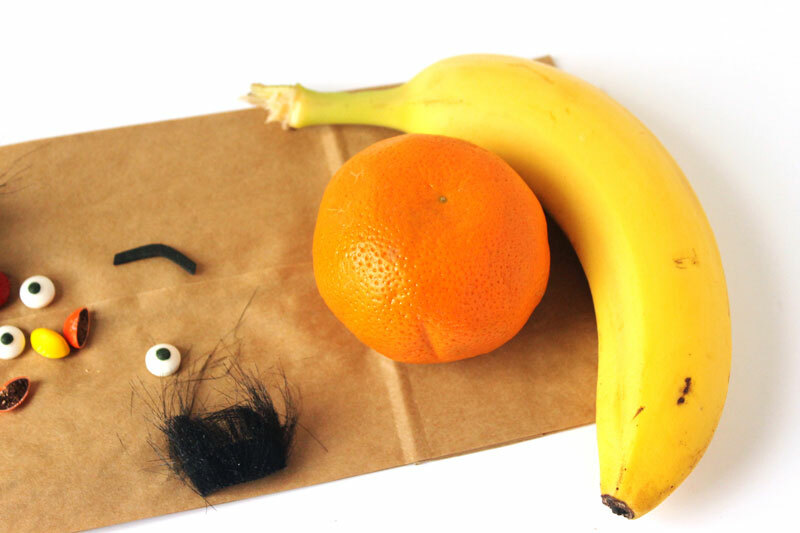 Cut one thin, long eyebrow from the black craft foam and glue it just above Bert’s eyes. 6. 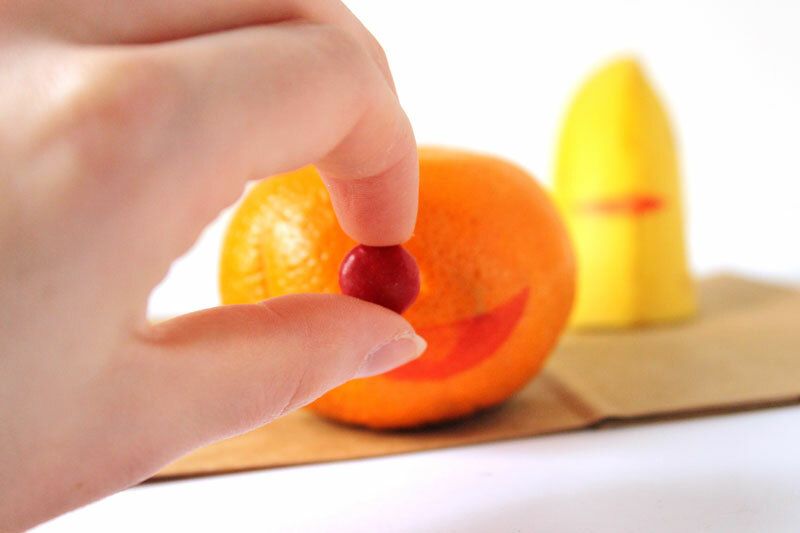 Cut one yellow M&M in half and one orange M&M in half. 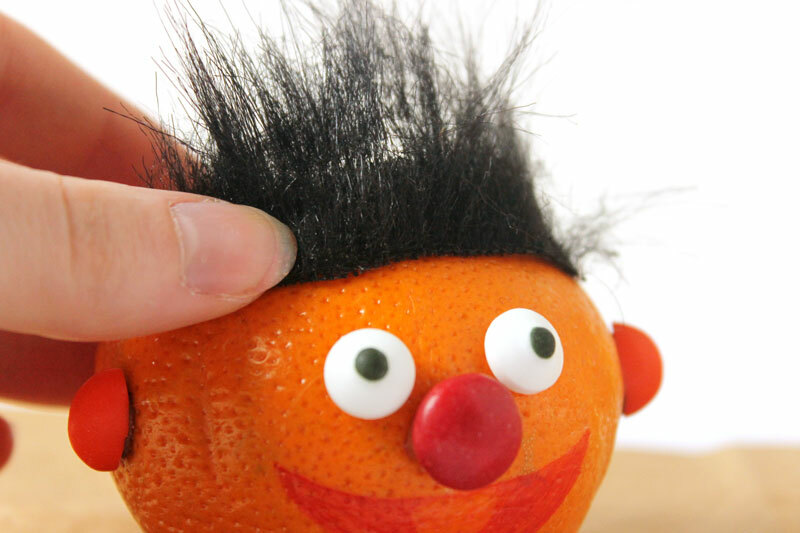 Carefully glue* the yellow M&M halves to the sides of Bert and the orange halves to the sides of Ernie to make the ears. Alternatively you can hot glue on colored craft foam. 7. 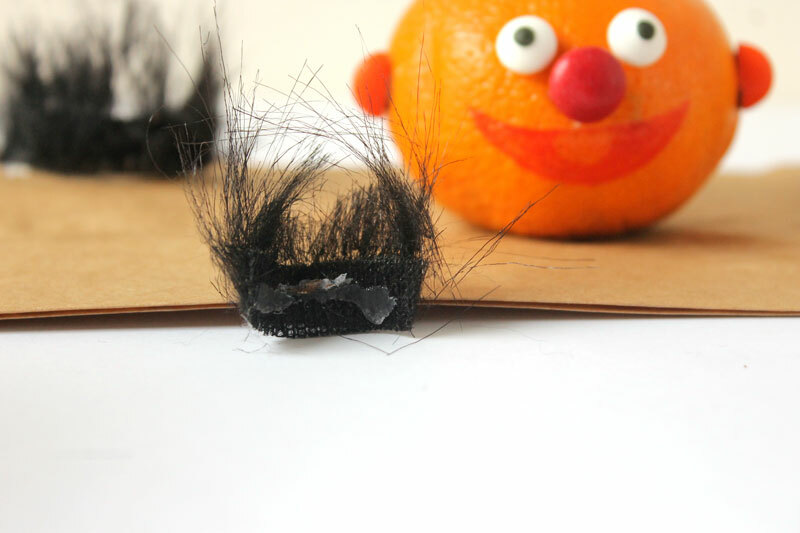 Cut two pieces out of the black craft fur–one piece should be wider and the fur cut a little shorter to top Ernie’s head, and the other should be a thinner piece with long fur for Bert. Cutting from the fresh edge of the fur works best. Hot glue these onto the orange and banana. That’s it! 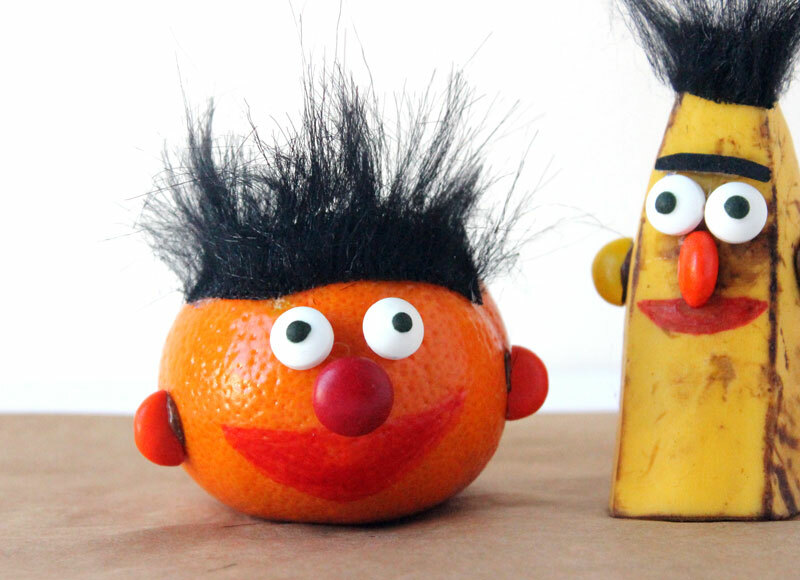 Your Bert and Ernie snacks are ready to eat, and are sure to be a huge hit! *Glue use note: Adult supervision required when using hot glue. Take care gluing on small pieces as this glue gets very hot. If using hot glue, be sure not to let the children eat the glue or the candies that touch the glue; the full M&M pieces and candy eyes should be okay to eat if they peel off completely from the hot glue, but if you have concerns, please opt for the edible glue or choose the completely inedible decorations and make sure the children know not to eat these. 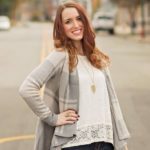 About the Author: Alyssa is a military spouse and homeschool mom of two energetic boys. She specializes in all things quirky, artsy, and unique. Alyssa loves cows and her goal is to someday homestead (and, of course, have a pet cow). Visit her website for more unique crafts and recipes for all ages, parenting and military resources, printable coloring pages, and more! Crafts for kids, Fun foods, Kids, Mom Crafts, Preschoolers, Quick and easy crafts. Bookmark. Decorate Sunglasses – Upgrade a cheap pair!